Can you hear me now? If you can, then a complex set of tubes and vibrations are working together to help you hear such as those in the picture to the left. Sound cannot be heard without waves. See how waves and sounds work together to produce what we hear! Just click on Catch the Wave to begin! Join Professor and his cat Proton as he tests his latest invention in learning about sounds. 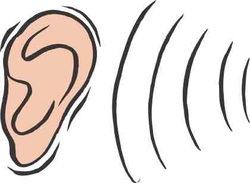 How We Hear explores many of the different ways our hearing is effected by the world around us in wonderful ways! What happens when the string on a guitar is shortened or lengthened? Can you tell if a sound is loud or soft, high or low? Check out the activities at BBC Science Clips Changing Sounds to see how savvy you are are at creating a new world of sound! How can individuals who are deaf or hard of hearing communicate? One way is through the use of sign language. Learn a few words in sign language at ASL Pro. If you already know alot of signs, you can quiz yourself or learn how to say sign language phrases used in conversations.